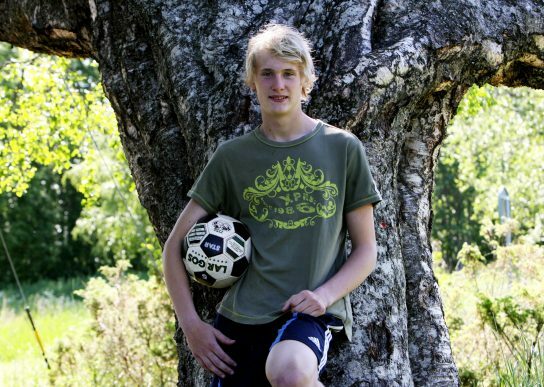 Ludvig Öhman was brought up in Umeå, but left as a fifteen year old to pursue a career in football. His hometown never forgot him and his local newspaper Västerbottens-Kuriren today wrote a long story about Grimsby with some quotes from Ludde himself. Karl Sundström wrote the story and posted it here! For English readers have I made an attempt to translate the story below. After a turbulent season in Sweden, is the Umeå son trying his luck on British soil. In a long interview, Ludvig Öhman tells about the tough season at Brommapojkarna, if he considered a move home to Umeå and the picture of the stereotype on British football. «Earlier I had a picture that the game here should be more meaty guys and physical , but that is not quite like it is,» said the former Sandåkern talent. Suddenly the referee signaled that it was time. It had only been a few days since he came to the country, but now it was time for his debut after just a handful of training session and severeal months without having played a competetive match. With 20 minutes left, the son of Umeå jogged out at Blundell Park for a match in League Two with his new club Grimsby Town against Macclesfield, and meanwhile he presented himself for his new home crowd. Much has happened since the 15-year-old Ludvig Öhman left Umeå and Sandåkern’s classic gravel and grass turf to try his luck at Kalmar FF. Three years later he made his debut in the Swedish Premiership, Allsvenskan, and then gradually established himself in the team. After a stay in Japanese Nagoya Grampus and later on AFC Eskilstuna and Brommapojkarna, a new foreign move became clear for Öhman last week. Manager Michael Jolley got what he wanted and Ludvig Öhman flew to Manchester and then drove two hours to Grimsby. A port town on the British East Coast which is said to have received its Scandinavian sounding name from a Danish fisherman named Grimm. Fishing is also what the town in many ways revolves around. 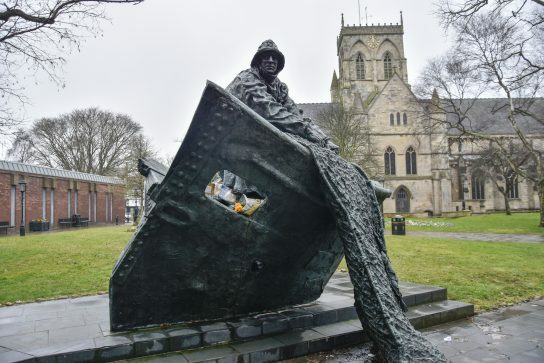 For a long time, Grimsby was a thriving and very professional fishing town. But like many other British towns, especially on the east coast, Grimsby has had a hard time adjusting to the post-industrial society. The Cod War against Iceland and the EU regulations on fishing made life in the town more difficult and has characterized contemporary times in Grimsby. Therefore, the votes of the fishermen to leave the EU were very strong and of symbolic weight when the British went to the 2016 polls. In a parallel the footballs continue to roll. So it has been since 1878. The football club Grimsby Town plays in League Two which is the English fourth division. A division that long has had a repuration for having a rather browinsh and traditional type of football. But Öhman thinks that has changed a lot. «It is probably quite speedy, physical and tough. Earlier had I the picture it was more fleshy and physical than it might be in reality. It was probably more so a few years ago, but football is changing. But it is clear that it is a game where it quickly goes back and forth,» says Öhman who now lives in a hotel while he waits for something more permanent. The English football landscape is slowly but surely changing. The astronomical Premier League money is slowly declining down the divisions, and global and international influences are growing even below the stars in Premier League. For example, the second division is topped by Leeds, that is lead by perhaps the most progressive football coach in Marcelo Bielsa. While the gap between the Premier League and the Championship seems to be diminishing in terms of modern football, there is still a fairly large gap to League One and League Two in terms of the way to play football. But there, Grimsby, led by Michael Jolley, hopes to contribute to something other than a grumpy British stereotype football. Grimsby Town is a club that, paradoxically, does not play their home games in Grimsby, which away fans not are late to make a point of. The team both play and train in the town of Cleethorpes, which more or less has grown together with Grimsby. When the club met London outfit Crystal Palace in the FA Cup was it estimated that 5 800 away fans made the trip. «It really is a town that loves football and it means a lot to them,» said Öhman. And this weekend, on a classic Saturday 15 hour kick off, Öhman got to experience the British football culture for the first time as a player. After just a few training sessions with his new club, he came onto the pitch in the 70th minute in the 0-2 loss to Macclesfield, managed by former Arsenal legend Sol Campbell. It was a first taste of British football. In the team against Macclesfield was there also another Swedish. At the end of the year, former Örebro player Sebastian Ring signed for Grimsby and debuted at home. Öhman belongs to star agent Hasan Cetinkaya’s agent company (who among others represent the national team players Victor Nilsson Lindelöf. Robin Olsen and Emil Forsberg) where several people work. When Öhman made the move to Japanese Nayoga Grampus, the agency company contributed a great deal. Now when the move to England came along, it was more about the relationship with Michael Jolley since the time in AFC Eskilstuna. «I had a contract with Brommapojkarna so in a way you had to respect it. Then you could express your wishes that you wanted to test this. Even if you are not old you still get older in football. So I see it as an opportunity to test on something new and I’m happy for that,» says the 27 year old. Öhman came from a very special season with Brommapojkarna in the Allsvenskan. His manager Luis Pimenta was fired after players accused him of both punishment and bullying and where the leadership was much about sexism and pennalism. To top it all, BP was relegated after a Play Off against AFC Eskilstuna. For a long while it seemed that Öhman should save BP having scored against his former club – but AFC turned it around and won after a goal with a quarter to go. Much has happened since his time at Sandåkern. Öhman has lived almost half his life outside the home town of Umeå and made a name for himself in Swedish football. He didn’t look at Umeå’s second division clubs as a relevant move. At least not this time.